I would pay to fly out to California for this. I really would. Interior tours of this 1949 Eames House, built as #8 in the Case Study series, are usually reserved for members of the Eames Foundation. 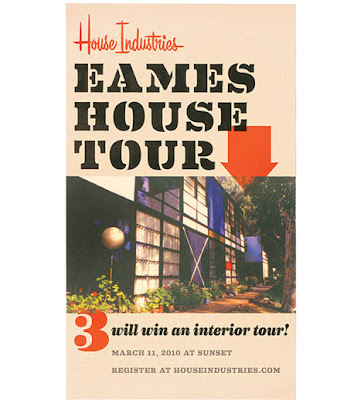 But three lucky ducks will win tours led by Eames grandchildren thanks to House Industries. Click here to enter. I visited the Eames house back in 1999, and received an interior tour of the lower level. It's worth the trip. The only reason I was able to get in back then was that one of my professors once worked for the Eames' in the early 1970's. Thankfully, it's a little easier to get in there now. By the way, you have a great blog! This is my first visit, but it won't be the last.